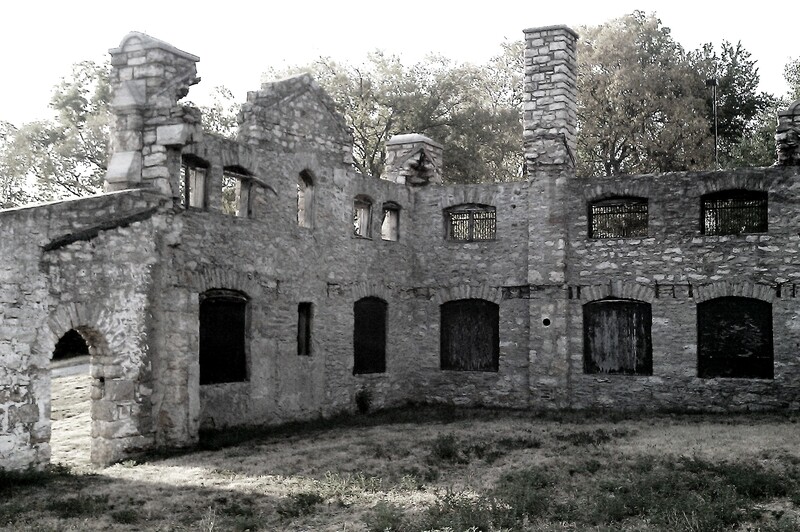 A castle it is not, but at one time this structure served as a Kansas City Parks & Recreation maintenance facility. It was a rather unique structure when first constructed in the heart of urban KC. Unfortunately it caught fire many years ago. All that is left are a few walls of stone upon stone, along with some boards and steel bars in window openings. Vegetation has taken over the floor. The roof is long forgotten. An arched doorway still welcomes the occasional visitor as an afternoon’s shaft of light draws the unsuspecting passerby. I find this structure fascinating because its architecture doesn’t fit the surrounding areas’ buildings, and because what is left of it remains standing. I can almost visualize the thousands of footsteps that crossed the threshold, the horses and machines which passed through the missing barn doors, and then the plethora of vehicles which filled the now vacant garage and parking areas. History can certainly be fun to imagine. Ironically, this place reminds me of some people; hard on the outside and empty on the inside. Often intriguing to look at, yet tragic when one realizes there is hollowness. If you know someone who resembles this description, rather than turn away, consider illuminating their inner being by shining your own light upon them…even if it’s only for a short time. Every ray of light displaces darkness and every kind word or thoughtful action bears fruit; even if only as a seed. For seeds grow and light illuminates which is why we must, as often as is realistically possible, be seed sowers and dispensers of light. Sow and shine…simple concepts, but often difficult to execute. Try anyway. 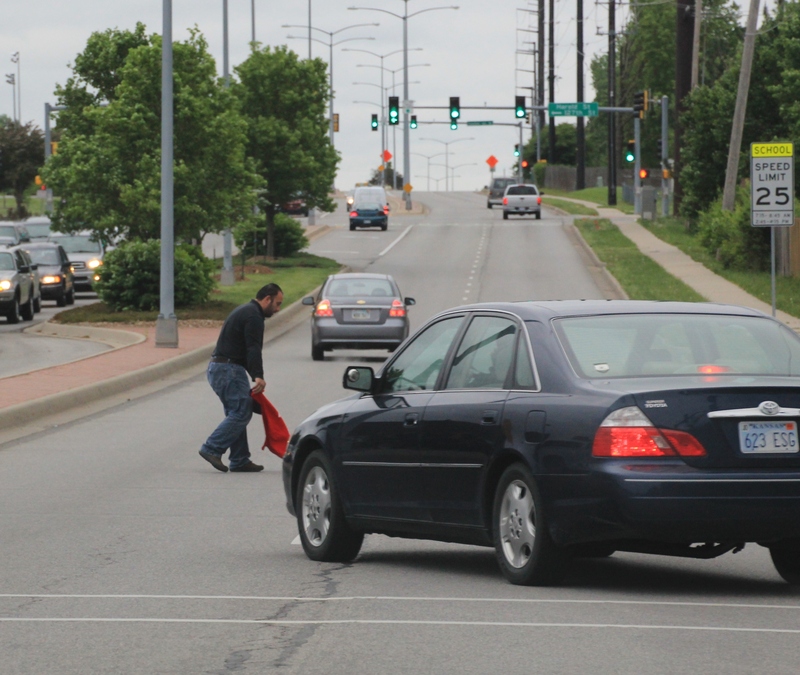 On my way to the office this morning I drove a route which passes in front of an elementary school, and at its busiest time of day…drop-off-the-kids time. I usually don’t drive this particular route due to cars backed up for a blocks and traffic intersections jammed. However, it was meant to be as can be witnessed by these photographs. The quality is not the best as I shot though my not-so-clean windshield, and in a hurry. At first I was perplexed because of my limited view, but then I was pleasantly surprised and encouraged by what I witnessed. What is going on here? A man with a cape. Is there a bull before him? Toro, toro! No bull, just ducks ! 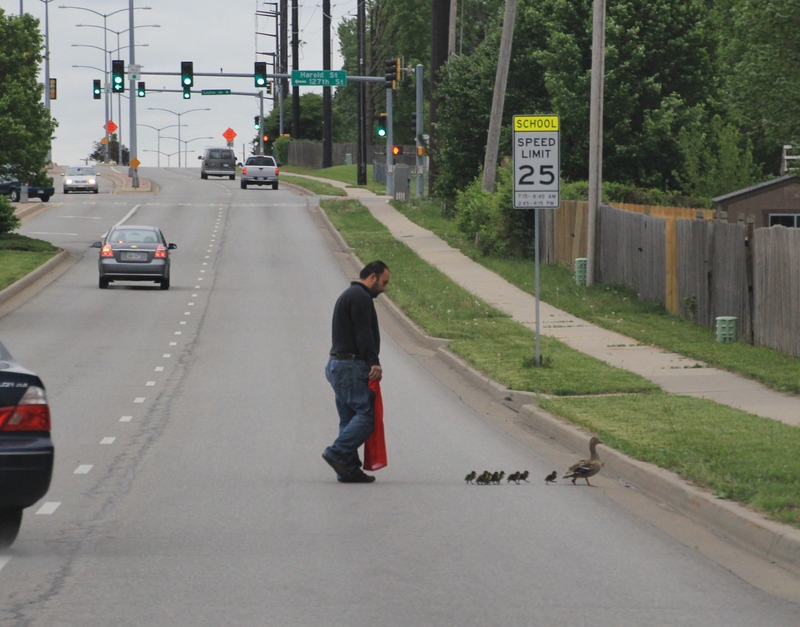 This kind man was herding mama duck and her ducklings across the busy street. As the drama unfolded, I couldn’t help but notice how gentle he was despite the urgency of the situation. 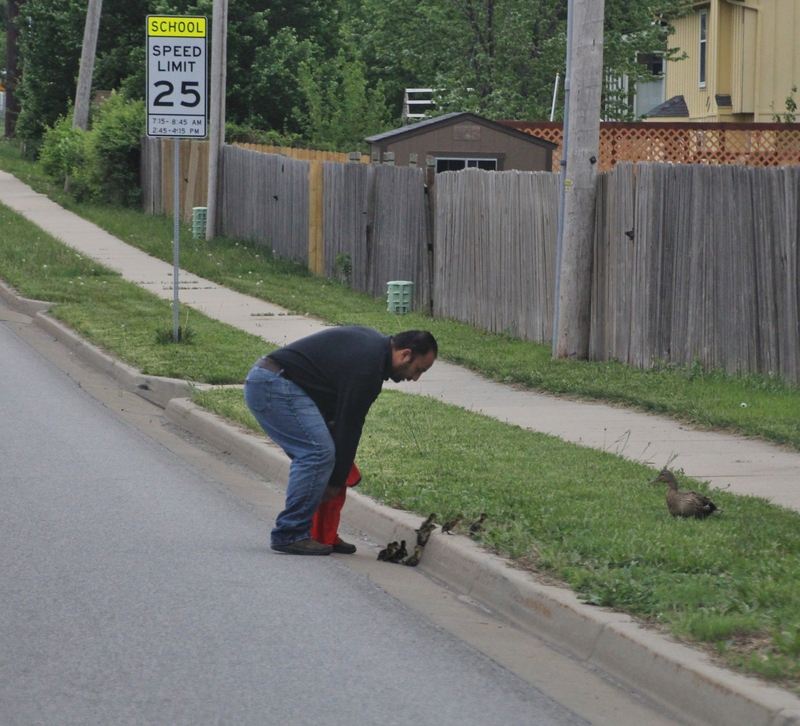 As mama looks on, this good Samaritan makes sure each duckling reaches the safety… of the grassy area, and away from the vehicles which could have spelled doom for these little guys. Notice her counting each one to make sure all made it safely across the street! Mama seemed grateful for his assistance. 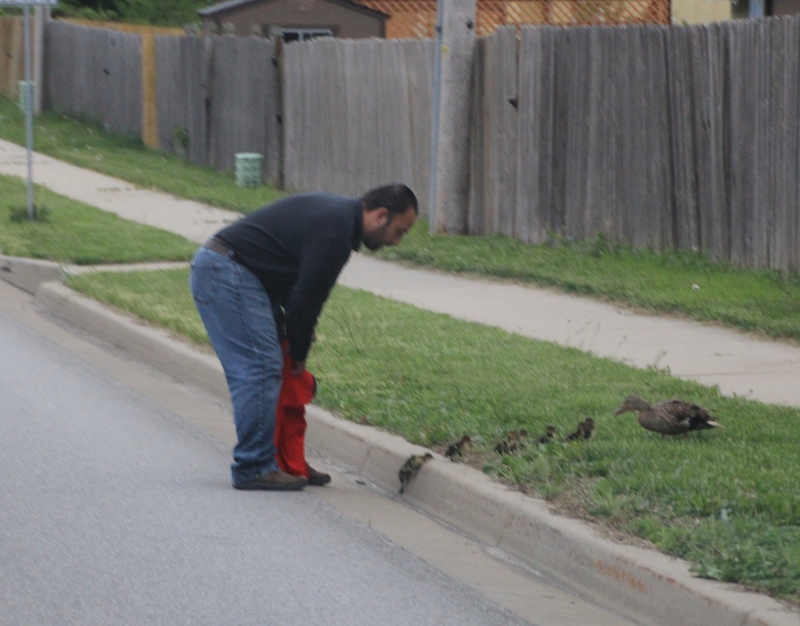 Due to the traffic congestion I didn’t have an opportunity to stop and tell this man that what he did not only helped some ducks, but made my day. This was no random act, but a deliberate one. Whoever you are, may you be rewarded for such an act of kindness. As a photographer, one has to be ready at a moment’s instance to capture something strikingly beautiful or unusual…or, in this case, something that is an everyday occurrence, but most never witness. In a nut shell, photographers are opportunists. 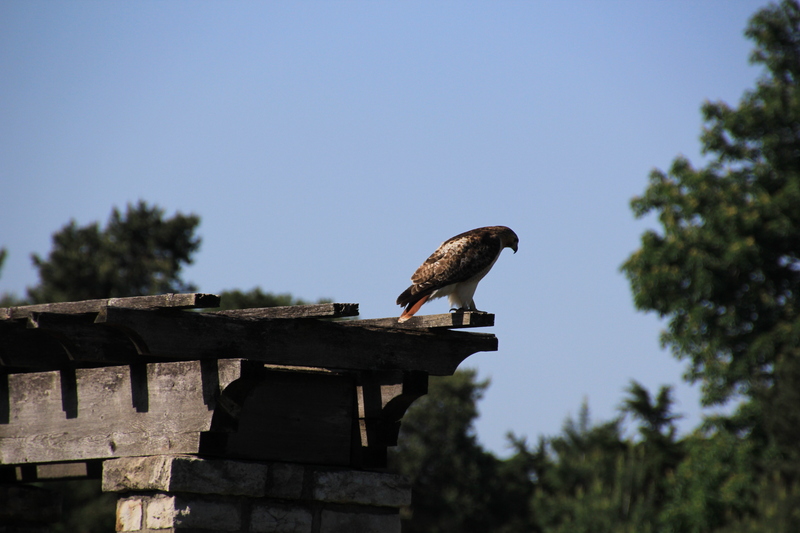 With this in mind, I present a bird of prey that was an opportunist on Saturday morning. While at Loose Park, one of Kansas City’s jewels, Cheryl and I strolled through the rose garden. It is still a bit early for roses, but something else caught our eyes and lenses. 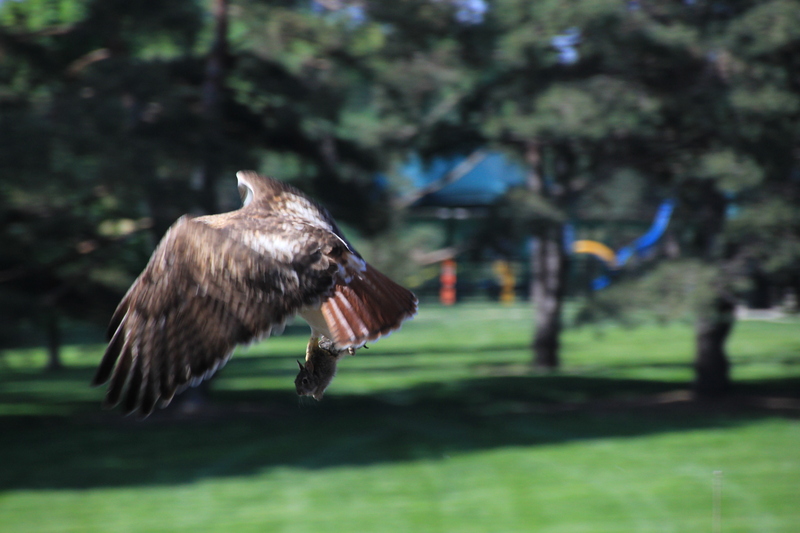 A red-tailed hawk catching his breakfast! I must apologize for the blur in these photos due to being startled by what was taking place, but I wanted to share them anyway simply because nature is so awesome. It happened so fast that the entire episode lasted mere seconds. The eating of the prey took all of five minutes. All photos are unedited. 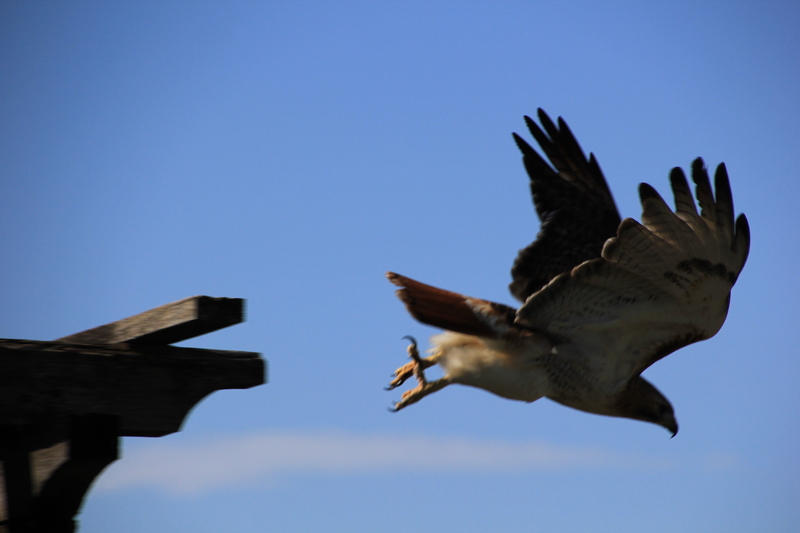 The prey was spotted and the predator took off…. 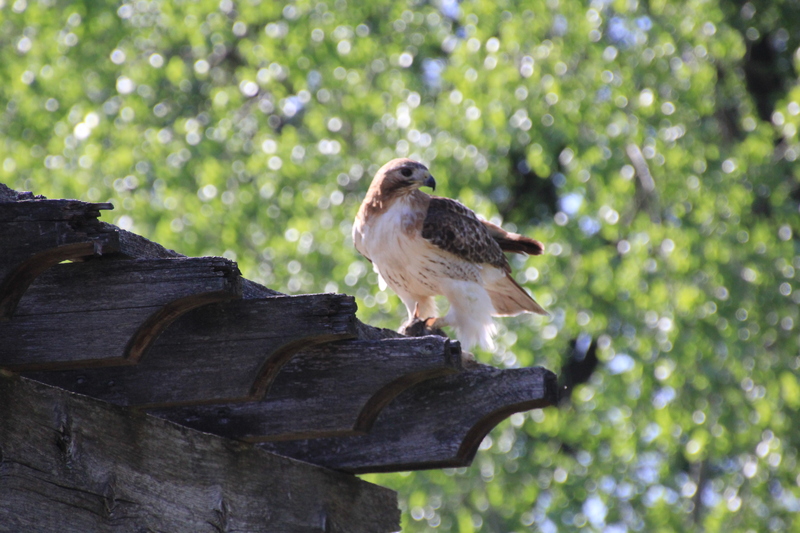 Bringing back his reward… And, preparing to dine on the same perch he catapulted from only a few seconds ago. Some call this dynamic the circle of life. Perhaps it is…life for some and death for others. It is the way of this world we live in. One day, there will be no more death. What a glorious time that will be! 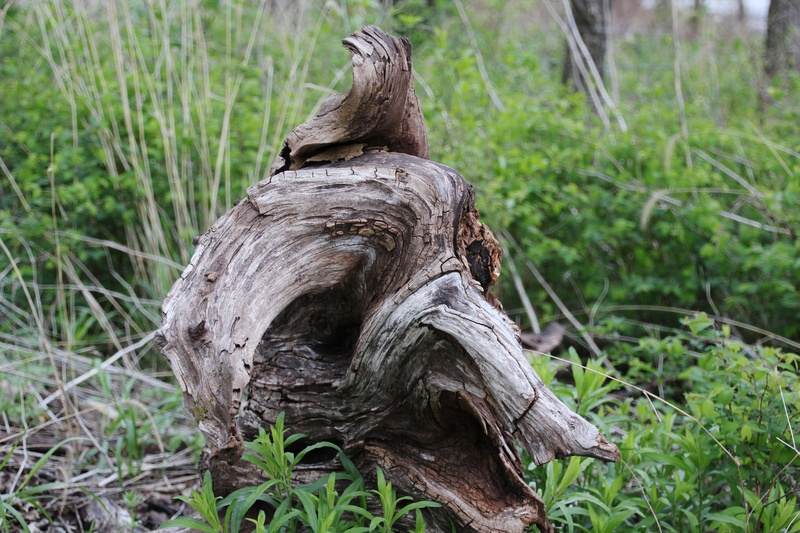 Driftwood is a fascinating thing to observe. One can see beauty, and another see ugly. One can discern features similar to an object they are familiar with while another may think you’re nuts! Whatever the case, driftwood is as unique as snowflakes. Take this specimen for example: only God knows the journey this hunk of tree has made. How did it become separated from the roots and taller trunk, or gnarled beyond recognition, and bleached and stained to perfection? Ultimately, it has been reborn into an image vastly different from when it started out as a sprig with a single root. Reminds me of people, especially after spiritual rebirth! Has there been a time lately when you have been discouraged, over-burdened, worn out, despondent or confused? Perhaps, all of the above at a given time? Please say yes, as I don’t like to visit this grubby junkyard alone. It is not a fun place to wallow in the muck, the trash and debris. Rationally thinking, I doubt I am the only soul who has occasionally experienced these feelings (more often than I like to admit), but this realization brings little comfort to me. I know folks often say that misery loves company, but that is a farce because someone elses pain cannot console our own. So, what does this blithering have to do with eagles? Glad you asked for the answer is an upper and not a downer! Just the other day I found myself in the junkyard, and I didn’t want to be there. Recently, I read a devotion which emphasized the renewing power that God offers to each of His children. Most of you are familiar with these verses, but just in case you aren’t or don’t have them memorized, I will recite them from the book of Isaiah, chapter 40, verses 28 through 31 (NIV). God spoke them and Isaiah wrote them. “Do you not know? Have you not heard? The Lord is the everlasting God, the Creator of the ends of the earth. He will not grow tired or weary, and His understanding no one can fathom. He gives strength to the weary and increases the power of the weak. Even youths grow tired and weary and young men stumble and fall; but those who hope in the Lord will renew their strength. They will soar on wings like eagles; they will run and not grow weary, they will walk and not be faint”. Sometimes we need a sign from God to let us know He cares. I know, we are not supposed to seek after signs, but that warning had more to do with proving that God existed in the person of Christ than signs of hope and comfort. My point is simple. 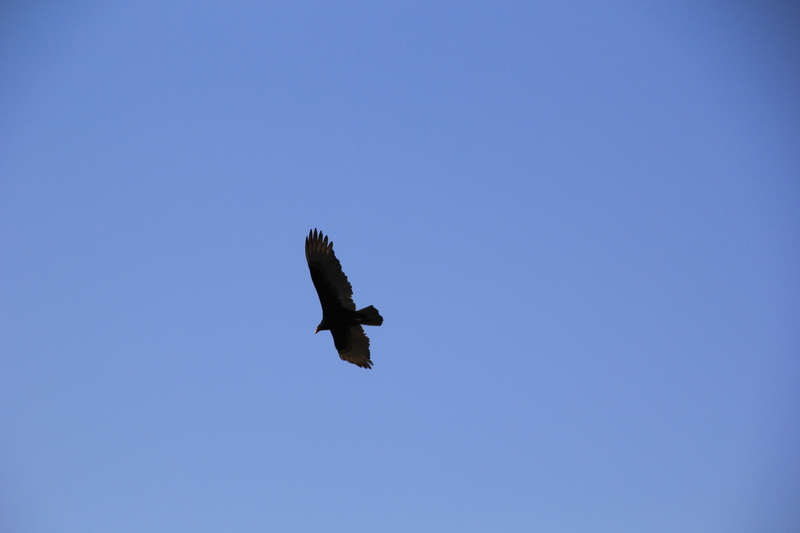 While at a future construction site the day after I read those verses, I witnessed an eagle soaring on the soft currents of air a few hundred feet above my head. 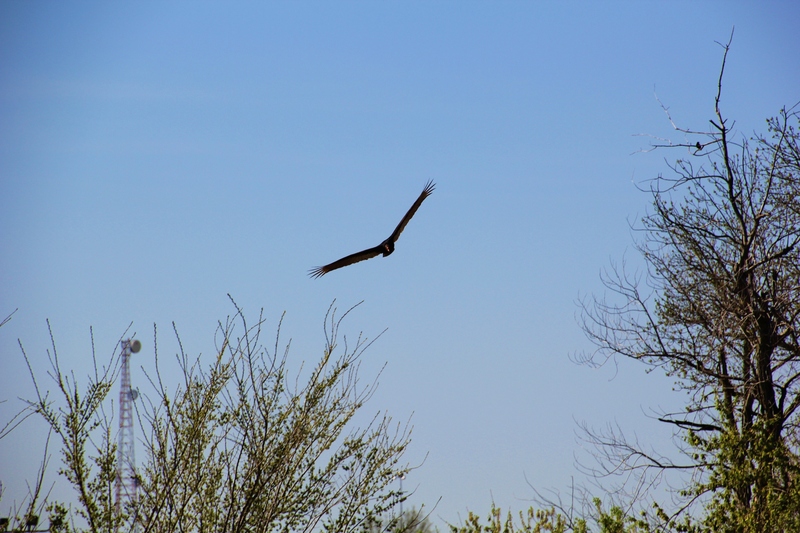 What was so unusual is that this beautiful bird was soaring over a busy railroad main line, an auto dealership, an industrial building, near an interstate highway and in an area without a swath of tree-filled land and quiet. In other words, he shouldn’t have been there. But he was, and I noticed, and I snapped away with my digital camera even though I wasn’t prepared for him. To watch hawks glide in the wind is always a treat for me, but to see this eagle appear from nowhere and soar above me and my partner for several minutes was simply astonishing. I’ll take that as a sign that the Father heard one of His children, and cared enough to let him know. It is my hope that you, too, will receive a sign from the One who cares the most for you. This sign may not be in the form of an eagle, but it could manifest itself as a soft word spoken in love at just the right time when you need it most. Or, your sign may be revealed in an anonymous act of kindness when least expected. Possibly, such a sign may simply leap off the page of a great book or Bible verse and impact you like never before. Perhaps from another blogger! Whether your sign of everlasting love is revealed on the wings of eagles or from the voice of one of his earthly angels, be encouraged. Recall God’s promises of hope, renewal and strength, and then be alert for He will respond. Sometimes all we have to do is gaze heavenward.